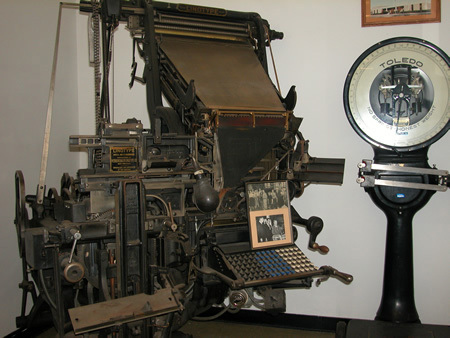 On January 10, 1865, the governor signed an act passed by the Nevada State Legislature creating the office of the State Printer to take care of the State’s printing needs. This was done through contracting with private sector printers. State Printing as we know it today was created when the 1879 Legislature eliminated the State Printer and created the office of Superintendent of State Printing, specially directing the Superintendent to “employ such compositors, pressmen, or assistants, as the exigency of the work may, from time to time, require ...” The act led to the construction in 1885-86 of the State Printing Building, the second-oldest structure built by the State in the Capitol Complex. The building housed State Printing for nearly 80 years. It now houses part of the Division of Archives and Records. State Printing moved to its current location in 1964. Nevada State Printing was transferred from the Executive Branch of Nevada to the Legal Division of the Legislative Counsel Bureau as of July 1, 2003. In 2005, the Legislature passed a bill enabling State Printing to accept work from any governmental agencies as well as state agencies, thereby increasing the incoming revenue stream and providing quality affordable printing to more regional entities. In addition to state agencies, our customers include universities and colleges, school districts, city and county governments, and various special districts.